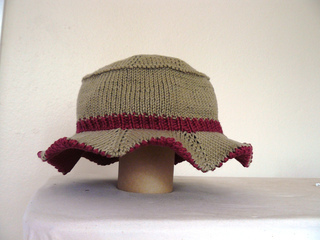 This is a cool cotton summer hat to keep the sun off your nose. Two sizes are given: one that fits my head (large) and a ‘recipe’ to fit the hat to any head. Note: while this intended to be a sun hat, cotton knits do not have a very high sun protection factor, so if you plan to spend long periods in the sun, I recommend accessorising your hat with some high protection sunscreen, and of course, your favourite flavour of lollipop.